Two more things from that French box; six items left to go. 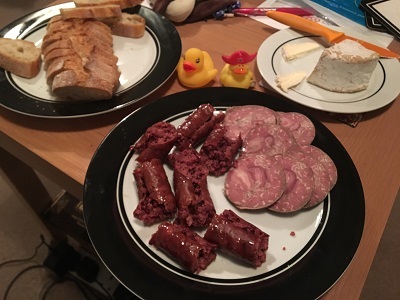 Now, I confess to only clocking at the final moment that the figatellu (the sausage on the left of the picture above) needed to be cooked. So I followed some instructions online, which involved the construction of a makeshift bain-marie, and completely forgot to prick it before cooking… which could have exploded the sausage a lot more than it actually did. The ducks seemed to enjoy the dinner tonight. Since it didn’t feel right to just have smokey meat and bread, we bought some Brillat-Savarin to act as a bit of a creamy palate cleanser. It worked. That cheese really is the best. So, cooking misadventure aside, the figatellu was my favourite of the two sausages. It’s an extremely meaty sausage with a course texture that reminds me a lot of morcilla, just without the extra non-meat packing materials. 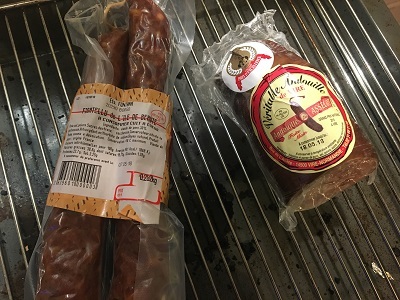 This Corsican sausage, however, is not a black pudding as it lacks blood. Instead what you have is a sausage where the main component is pork liver, which gives the sausage a rich slightly irony taste. As well as the liver taste there is a light smokiness and a richness (which comes from whine) that both really compliment the meat. The other sausage, the Andouille de Vire, looks beautiful when sliced. There is a pleasing swirly marbled look to the sausage, which is almost pretty enough to distract from the incredibly smokey aroma. For me, the smokiness of the casing was a bit overpowering (in both taste and smell), so I enjoyed it a lot more if I peeled half of the casing off. With only half the smokiness you can really taste the meat of the sausage, which is barely smokey at all. In fact the main bulk of the sausage has the clean meaty taste of a brawn without the jelly. It wasn’t as good as the figatellu, but I have quite a bit of this sausage left and I am keen to try it out in a toastie.